Are you a doomsday prepper who has a knack for thrill and adventure? Are you a survivalist? If the answer is yes, we have just the app for you! A FREE app, designed to quench the thirst of every adrenaline junkie and keep them on their toes. Through your iOS or Android phone or tablet, travel to different cities, overcoming wasteland enemies and building your character’s skills to reach your goal. The spine chilling story of a world in grave danger and how you can play a part in saving it, will reel you in before you even realize it. This game takes you on a journey through 42 different cities of the world, where each city unravels its own mystery, where you must carefully fight every monster in the way. Use your finest skills combined with a wide range of weapons to upgrade and travel city to city unraveling the tale of the toxic waste that the world has become. In this time of peril, will you be the hero that the world needs? The world is in the midst of planet wide armageddon and nuclear war. You are separated from your family and have been forced to survive in a wasted landscape filled with ravaging mutants and bandits. You have to protect yourself against hostile enemies as well as build up your skills as a doomsday prepper. Combat and skill building are the cornerstones of becoming The Ultimate Prepper! Although Ultimate Prepper is a free to play clicker type game, you have the option to purchase Platinum bars using real money. Platinum Bars (PB) will help you better prepare for the tougher challenges ahead. 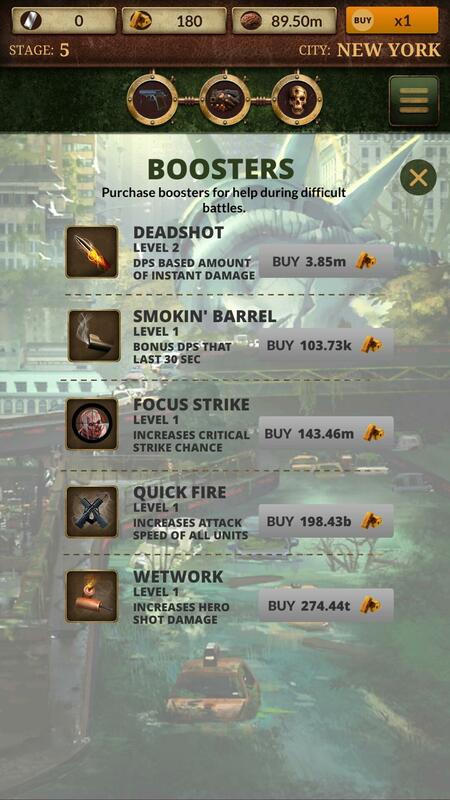 You can purchase game perks with PB that will give you a leg up over the enemy or a boost in the acquisition of survival skill building skills. You can also choose to watch short 30 second in-game ads that will give you a 2x multiplier bonus for each ad you watch. Hey we have to keep the lights on over here somehow right? In Combat mode you deal damage to the enemy with a wide variety of weapons by tapping on the screen. Tap fast as your adversaries will show you no mercy. You can switch weapons and activate temporary power boosters from this screen as well. 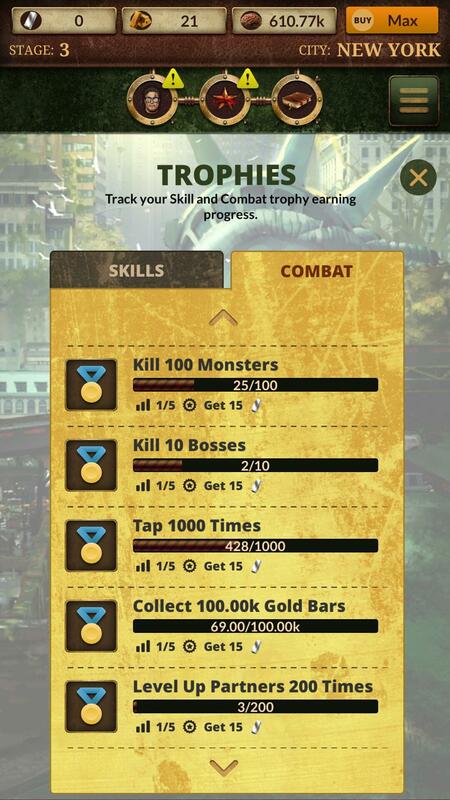 Each City (level) has 10 stages including 10 enemies, 4 mini bosses and a City boss. When you reach the City Boss, you have 30 seconds to defeat him. If you fail, you should buy a perk or continue killing monsters to earn more experience so you can purchase a better weapon and/or Parner Heroes. You must kill the City Boss and earn the requisite amount of Skill Building experience before you can advance to the next city. Every screen tap you make produces an enemy hit, there is also a small chance to inflict a Critical Hit (Crit) 1.5 times the normal amount of damage against the current monster. Combat in the wasteland is difficult and it will become necessary to hire partner heroes that will help you kill the vermin you encounter. There are 20 partner heroes available to hire. Tap on their avatars to read their skill profile and the dps (damage per second) they dish out. 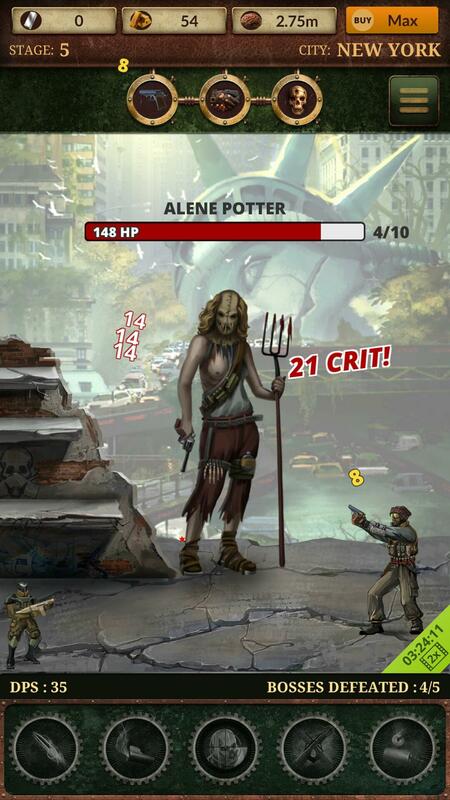 Leveling up your heroes increases the damage done to monsters in battle, as well as unlocks their passive skills. Each hero has 8 skills to choose from. Partners will continue to kill enemies for you, whether you are in the game or offline. This allows you to rack up gold even when you are busy doing real world activities...you can’t be expected to spend all of your time in the wasteland right? For each enemy you dispatch you earn gold. This can be used to upgrade and buy new weapons. Each weapon and upgrade inflict a different amount of damage to your enemy. 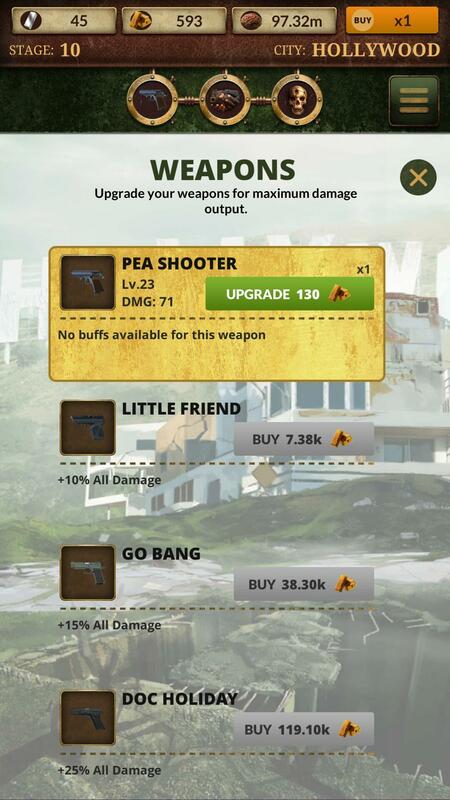 Weapons can be selected and their details viewed by tapping on the pistol icon. There are 5 combat power ups that you can acquire which will help crush your foes into dust. You should use them wisely as their power is only active for a small amount of time. Once a power up is used there is a recharge time that must pass before it can be used again. 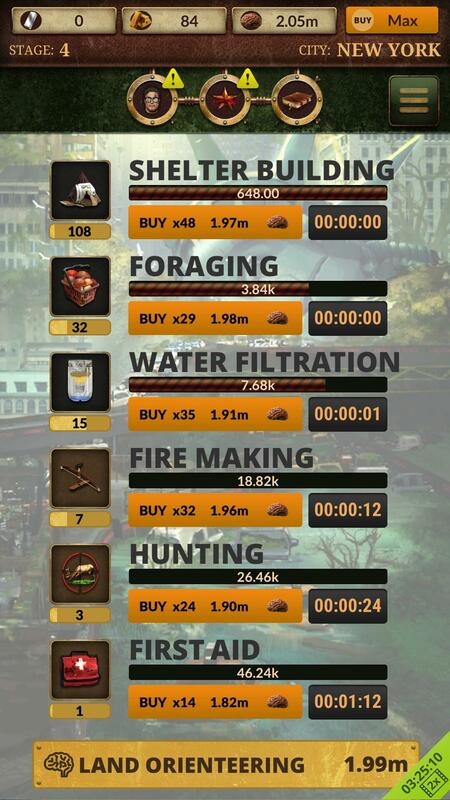 In the Skill Building screen you can improve your prepper skills by learning the fundamentals of survival. This is done by tapping on skill books to read them. The more skill books you read the better your skill will become. Once a skill is advanced to the required level, you can then learn more advanced skills that will round out your abilities as a doomsday prepper. When you reach a certain level you can use your earned experience to hire a Skill Trainer that will help you learn skills faster and automatically whether you are actively playing the game or not. 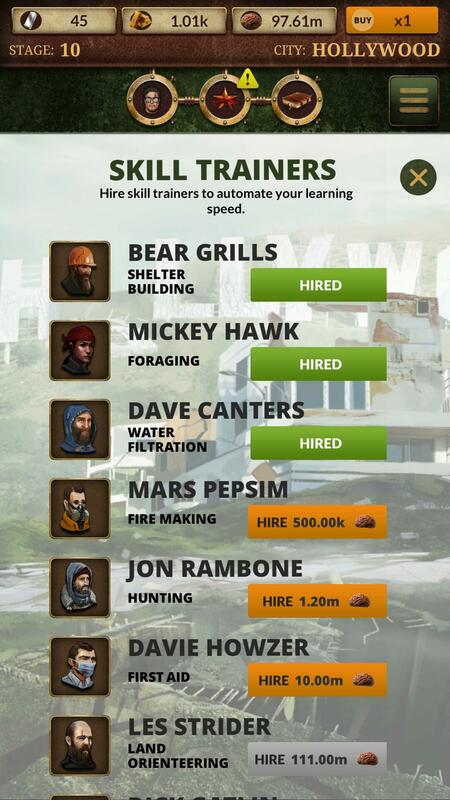 There are Skill Trainers for each skill available in the game. 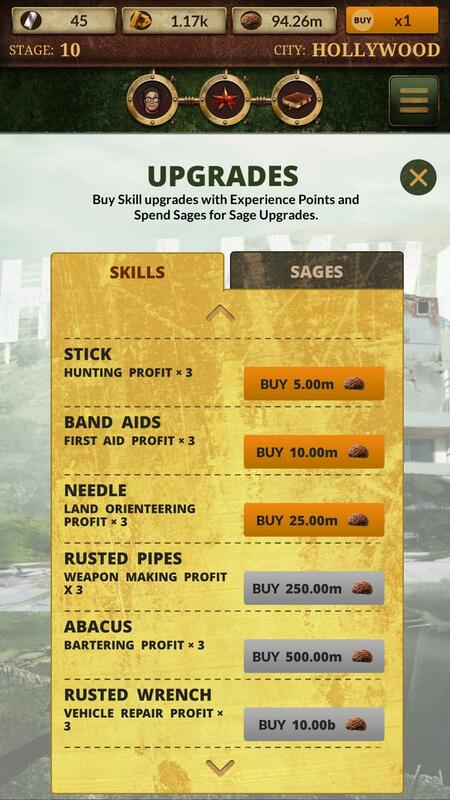 Numerous skill upgrades are available that you can purchase with your earned experience. 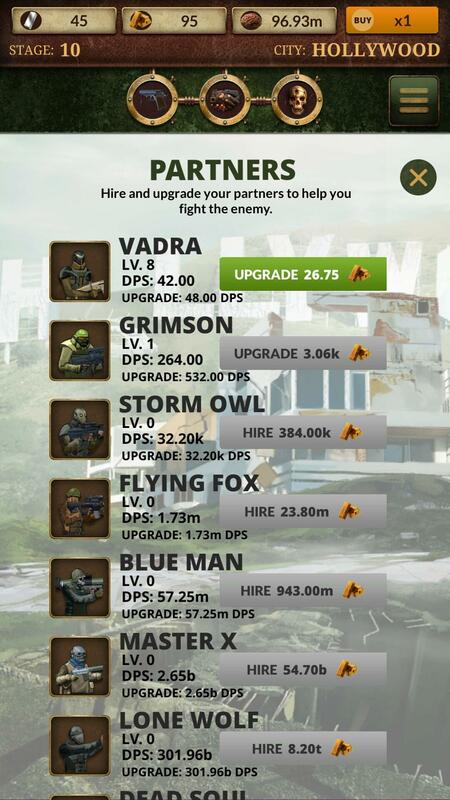 These upgrades are unique and will help you earn experience in a variety of skills much more quickly. Sages are master wise men, think of them as skill grandfathers. They are so knowledgeable in a skill that they will increase your experience by 2%! Sound great? It is, but with all good things, they come with a price. Claiming a Sage requires you to unlearn what you have learned therefore resetting your earned experience to 0. However earning this experience back will be faster because your learning rate will now be much quicker. The more experience you unlearn the more of a percentage bonus you will earn. Sage claiming can be done more than once. 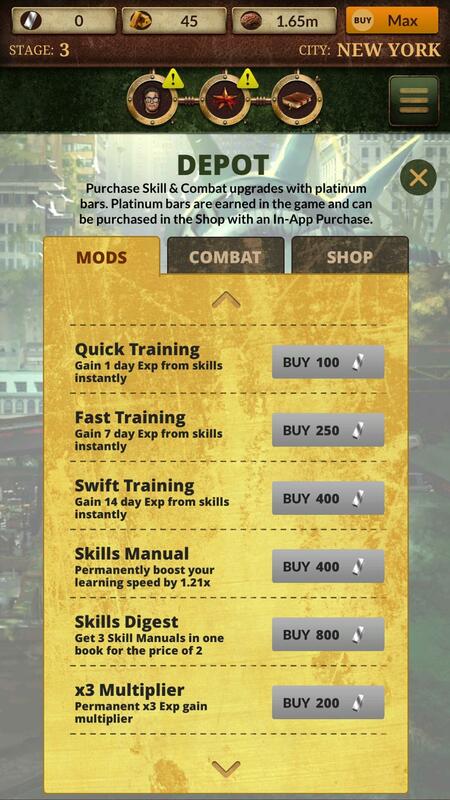 The Depot allows you to purchase with an In-App Purchase superior game perks for both the Combat and Skill Building game modes. If you get stuck or just want to progress faster, give these a try as they will give you a phenomenal advantage. Platinum Bars can also be purchased with an In-App Purchase. Platinum Bars can be used to buy a variety of important items in the game, including skills, partners and perks. All of your in-game achievements are tracked here. Trophies are earned in both the combat and skill building modes of gameplay. Earning trophies also rewards you with Platinum Bars. In the lower right hand corner of the screen is a video icon. Press this and you can watch a short 30 second In-App Video Ad to gain a x2 multiplier on your Experience and Gold earnings for 4 hours. You can watch a total of 6 ads during a 24 hour period. If used consistently, this will help your character growth immensely! 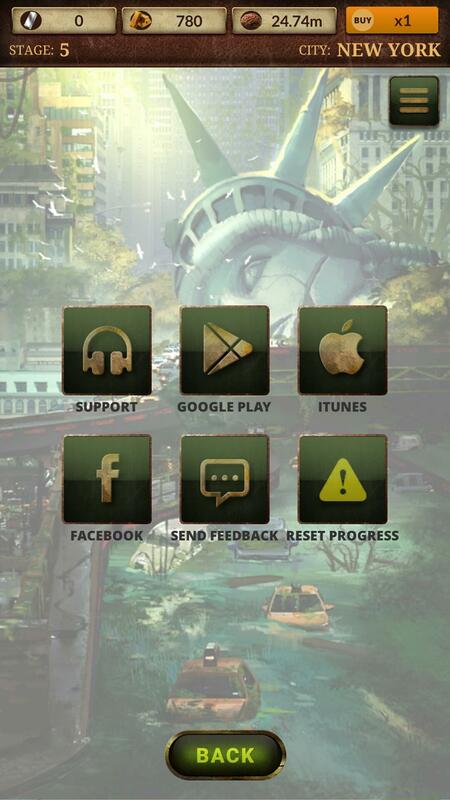 The 5 skill icons at the bottom of the Combat mode screen will become available as you unlock them with game progress. These icons each offer a special combat power after you press them. The power will remain active until the active icon stops. A cooldown timer will then appear indicating how much time is left until you can use the power again. If you don't want to wait you can buy the Refresh Boosters perk in the Depot. There is strength in numbers….having multiple partners will improve the damage you deal against your enemies and allow you to continue the fight even when you are not actively playing the game. Resetting and claiming Sages is a very important part of the game. 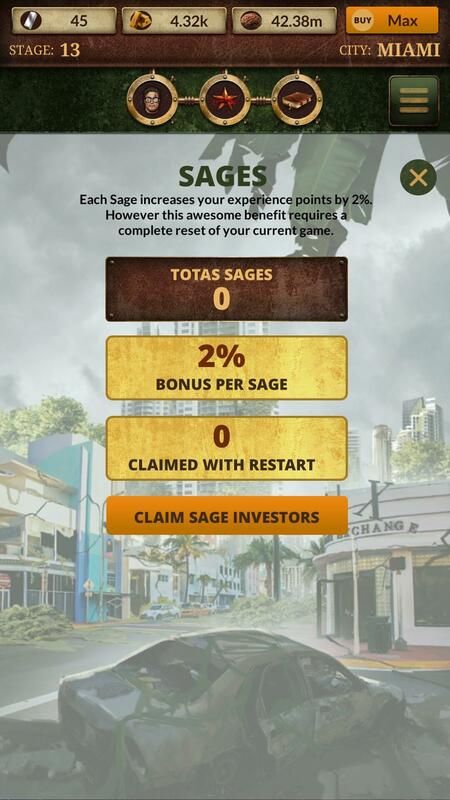 Claiming Sages will give you a permanent multiplier boost to all future earned game experience. Yes you have to sacrifice all of your experience up until that point but earning that experience back and more will be faster and easier! The Cloud Save System gives players the ability to hold one save game file. 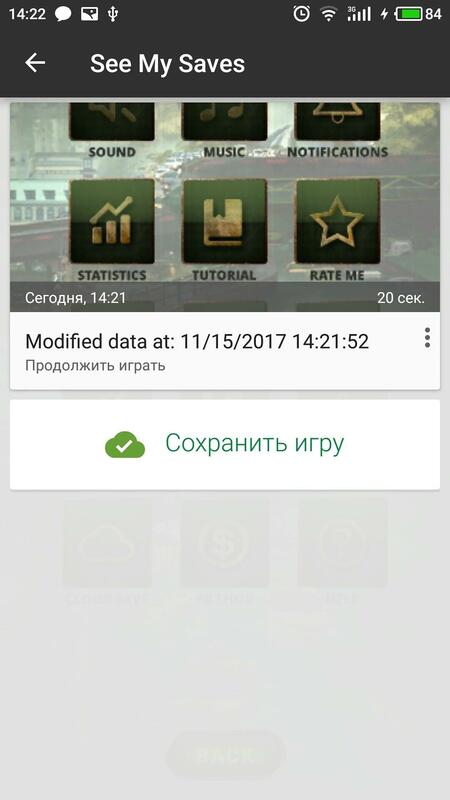 Players can save or restore a previous save by going into Settings and navigating to the Cloud Save icon. This is useful to keep a backup of your progress especially when upgrading or replacing your phone. There is no cross-platform support for the sync feature, this means you cannot take a save game from Android to Apple or vice versa. If you encounter an issue that is affecting your game experience or would like to ask a question. Click on the hamburger menu icon, Settings, Help, Support. We will do our best to help you.